Gagosian Gallery is actually something like nine galleries, located in several countries on three continents. As of 2012, it was estimated that its annual sales were 1.1 billion dollars. Gagosian Gallery is in the business of selling extremely high-priced consumer items to very high net worth individuals. So why the hell would they buy an ad on Twitter? Who are they trying to reach? Yet here it was, on my Twitter feed! Are they hoping to snag a few hedge-fund managers as clients this way? Seems doubtful. Of all their enterprises, only Gagosian Shop seems to sell things within the price range of any of the 99%. 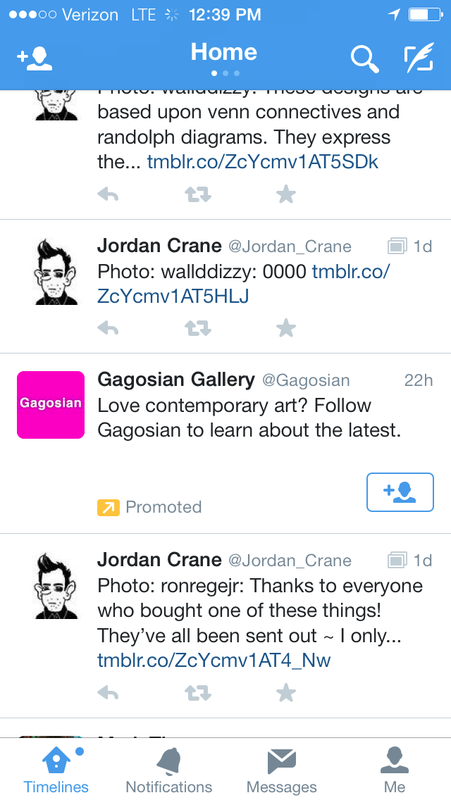 Gagosian's Twitter ad is a small mystery to me.